A classy executive gift, this black feaux-leather home-décor basket includes a coordinating 5x7-inch black photo frame, a handcrafted Glass Bead Letter Opener by Global Village, a division of the Glass Eye Studio in Seattle, Ste. Michelle Cabernet Wine, Portlock's Smoked Salmon, Elki's Crackers, Outrageous Offerings Chipotle Cashews, Macy's Cheese Sticks, Seattle Sinsations Buttery Pretzels, and Seattle Chocolate Truffles. 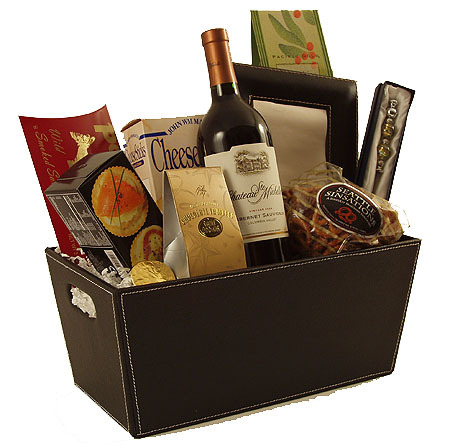 A great thank you gift, real estate closing gift, gift for women, gift for men, this gourmet gift basket is quite impressive! Available with wine, champagne or sparkling cider.